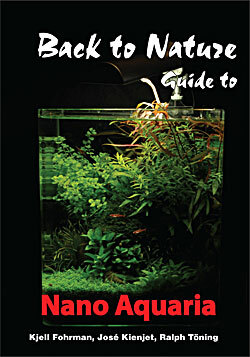 Chapters: The History of the Nano Aquarium, The Aquarium, The Water, Equipment and décor, Maintenance, Quick Start Guide, Examples of Nano Aquaria. Shrimp section: Shrimps in your aquarium, What are shrimps, How many shrimps, Several species together, Acclimatisation, Nutrition, The moult, Reproduction, Diseases species sections: Caridina and Neocaridina; Fan shrimps; Glass-shrimps; Long-armed shrimps. Species sections: Cypriniforms; Poeciliid livebearers; Killies; Labyrinthfishes; Rainbowfishes; Tetras; Catfishes; Cichlids; Other fishes. Plant section: Siting plants, Ligthing, Plant fertilizers, CO2, Plants and shrimps. Published in: English, German, Dutch, Swedish and Norwegian. In the last few years so-called “nano aquaria” have became very popular. The main reason for this is probably that they are small and will fit almost anywhere. Many beautifully-designed and functional nanos have been produced and numerous colourful freshwater shrimps and small fishes have been introduced into the aquarium hobby as well. Kjell Fohrman (Sweden) has more than 30 years experience of keeping and breeding aquarium fishes, both as a hobbyist and a professional. He has been chairman of several aquarium clubs, as well as trade organisations. 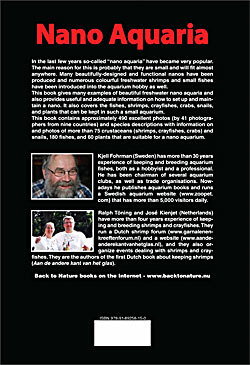 Nowadays he publishes aquarium books and runs a Swedish aquarium website (www.zoopet.com) that has more than 5,000 visitors daily. Ralph Töning and José Kienjet (Netherlands) have more than four years experience of keeping and breeding shrimps and crayfishes. They run a Dutch shrimp forum (www.garnalenenkreeftenforum.nl) and a website (www.aandeanderekantvanhetglas.nl), and they also organize events dealing with shrimps and crayfishes. They are the authors of the first Dutch book about keeping shrimps (Aan de andere kant van het glas).